In raw numbers, the gain from a single Raptor to a duo is impressive. 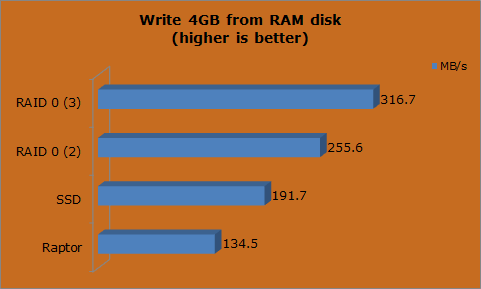 Average read speed climbs by 78%, and average write speed is up by 50%. 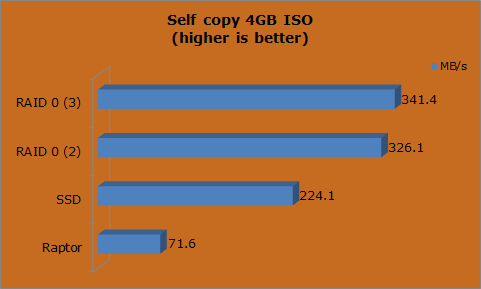 Adding a third drive sees the gains jump to 107% and 57%, respectively. 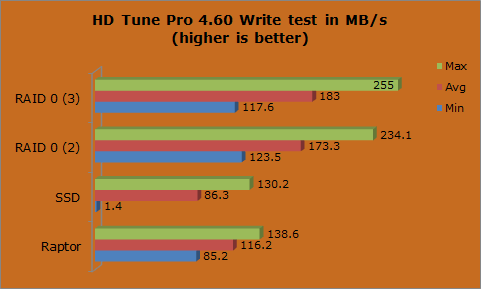 The SSD asserts a 43% advantage in read speed, whilst the write tests show some disturbing patterns that are most likely due to HD Tune Pro’s testing methodology. The maximum read speed of 131MB/s is pretty consistent for about the first half of the test, and then falls off a cliff as performance is extremely erratic, bringing the average speed tumbling down with it. This is the main reason using an on-board controller is frowned upon by enthusiasts. It will get the job done, but there are better (and hence more expensive) solutions available. 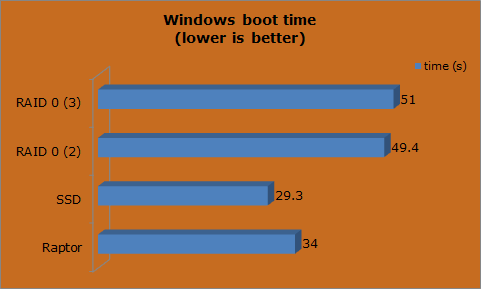 If Windows boot times matter to you, then RAID setups might not be your cup of tea, or at least not with an on-board controller. 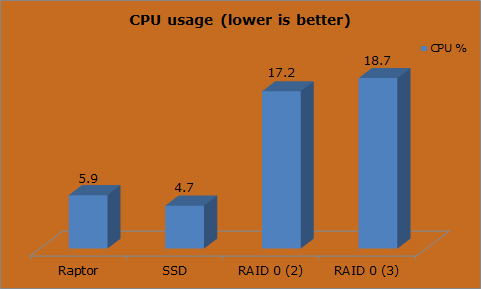 The SSD has a 16% advantage over the Raptor here, and the RAID setups are long behind. Time is wasted not only when your RAID controller scans the disks just after the initial BIOS POST screen, but then it has to allow a few seconds for you to hit a key sequence to access the RAID configuration. Adding to the delay is extra OS driver overhead, extra CPU cycles needed to manage the array, and the results are painfully clear in the graph. 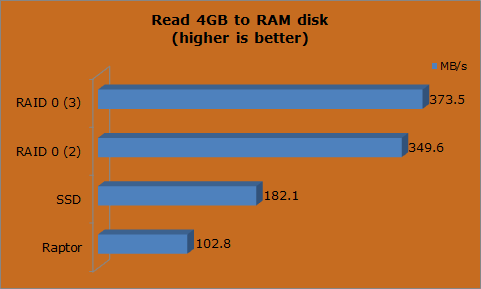 Note that these results would most likely differ significantly with a dedicated RAID controller, although there will always be an additional time penalty to scan for disks and allow user configuration. To say the single Raptor is struggling here is an understatement. 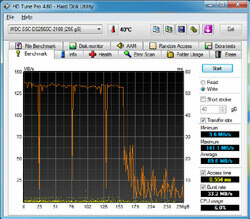 It gets thumped by the SSD, but absolutely turns the tables when the RAID 0 setup is invoked. The read tests show a similar story, as the Raptor is convincingly beaten initially, and then creams the SSD when it gangs up with (immediate) family. 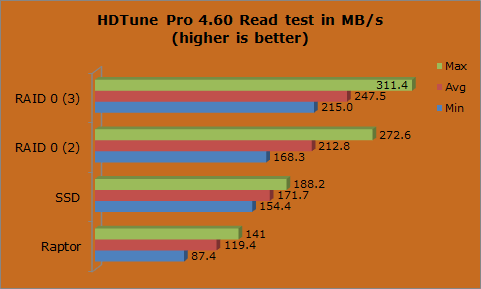 The write test sees the SSD’s initial margin slightly smaller, but the end result is the same with the RAID setups winning convincingly. These numbers do have a peculiar stench of “impossible” about them, though, and should be taken as not particularly authoritative.